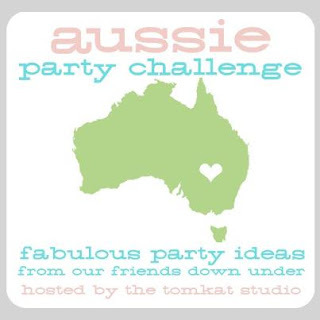 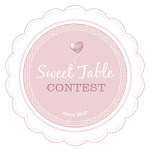 I was beyond delighted to be asked to participate in the Tomkat Australian Party Challenge a short while ago to showcase the amazing new range of printables by the Tomkat Studio. I have been a long time fan of Kim's work & I am an avid reader of all things Tomkat! 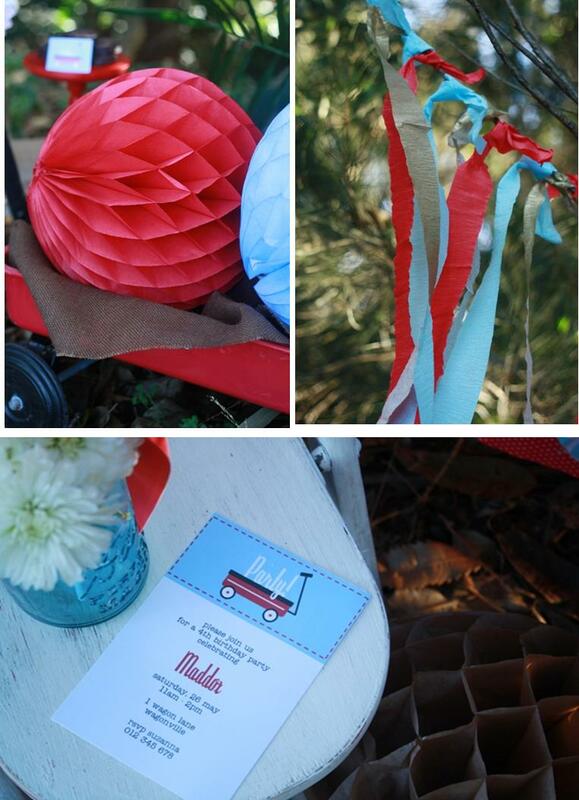 The Tomkat printables theme Mon Tresor was lucky to work with was Little Red Wagon. 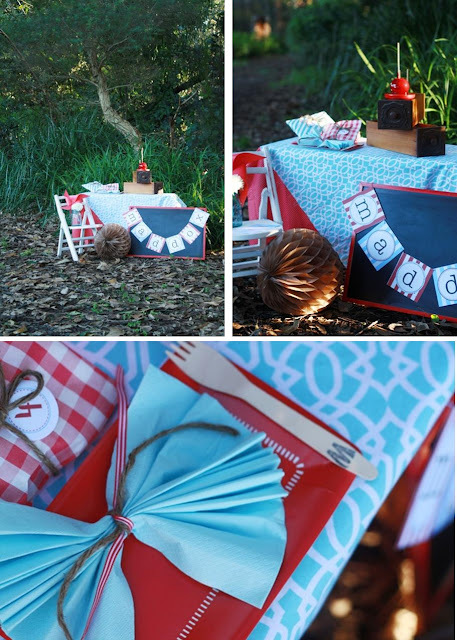 I chose this theme because I instantly pictured a lush green bush outdoor setting and I loved the idea of an outdoor meets vintage, rustic style party. The colour palette I worked with was blue, red and hints of rich chocolate brown & gold. 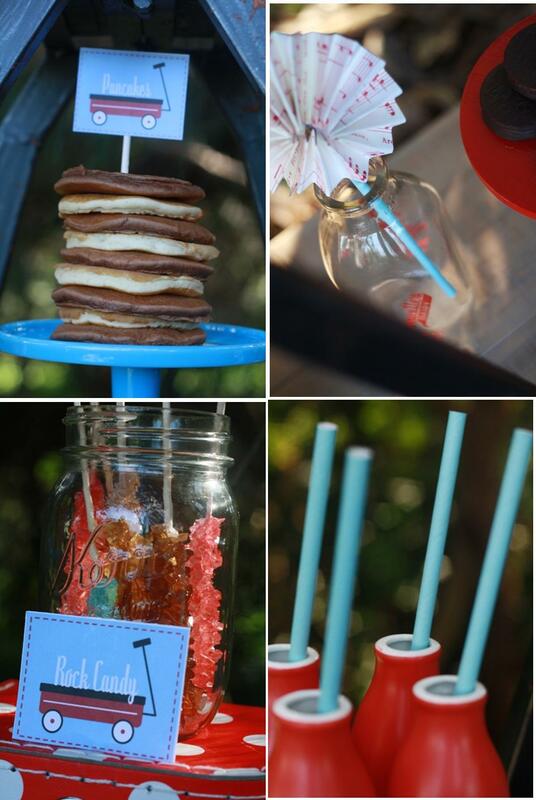 I kept the sweets to a minimum and used candy and sweet treats that didn't require too much baking in the kitchen! 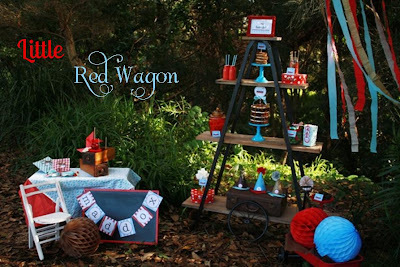 Hosting a party for your little ones should be fun and not too stressful, and this is what I wanted to acheive with the Little Red Wagon party. 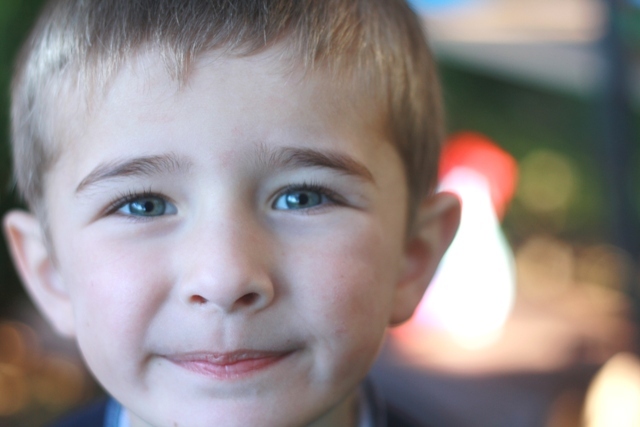 Affordable, fun and stylish. 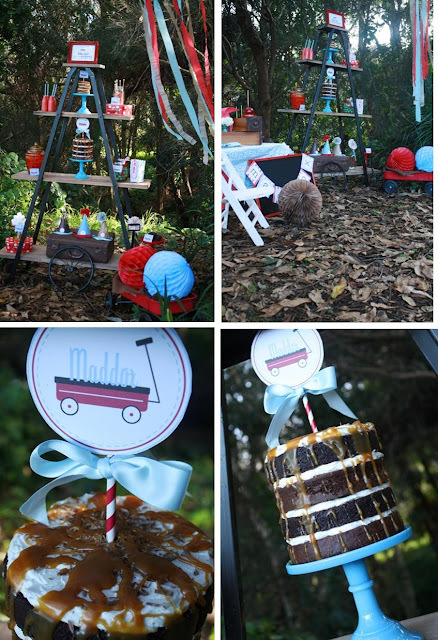 Because I wanted to infuse the Little Red Wagon party with an industrial, rustic feel I chose a wood and metal frame trestle shelf to display the cake, candy, sweets and props. 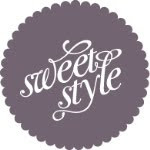 The mouth watering layered chocolate sponge cake filled with cream and topped with a dripping caramel topping and was made by my good friend Marie from Couture Cupcakes & Cookies. It enhance the the rustic vibe and tied in beautifully with the Little Red Wagon theme. 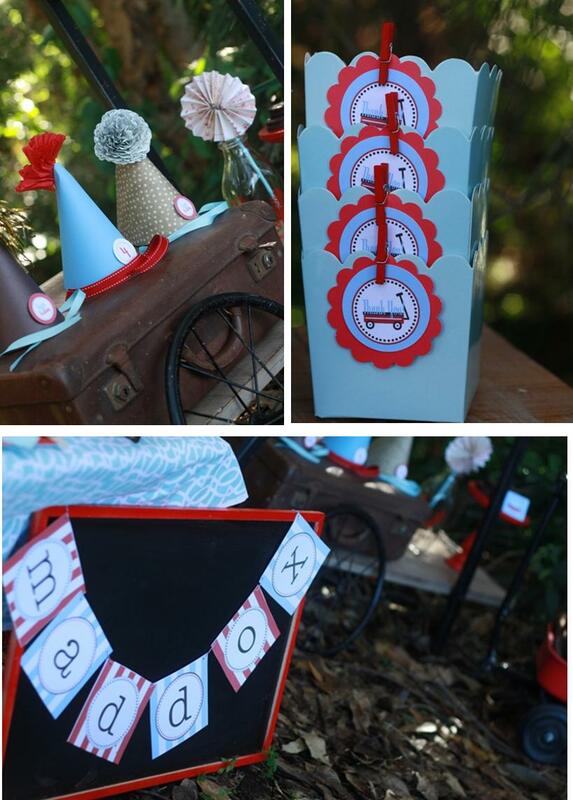 The Tomkat printable cake topper was placed on the cake. Toppers are a fabulous way to adorn a birthday cake as they add a hint of personalisation (with the child's name or age). 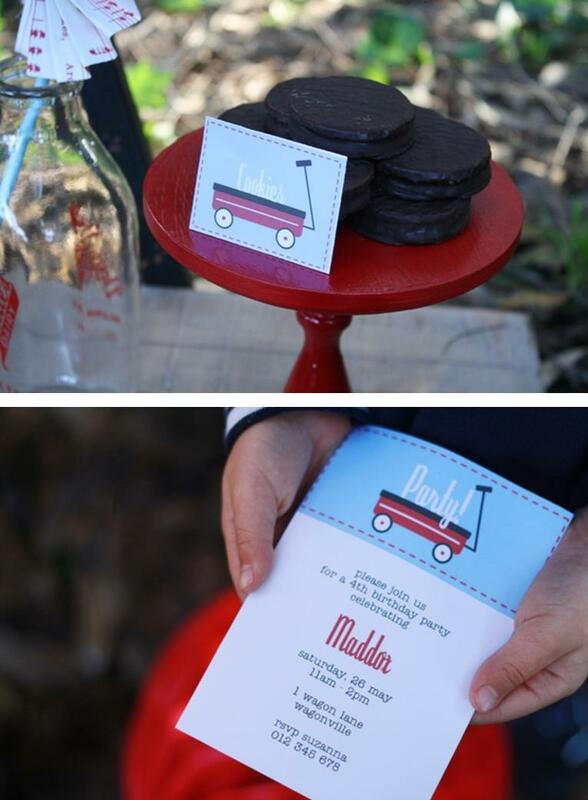 You can also find the Tomkat printed food labels were attached to the various jars and stands, which is another fabulous way to inform your guests of what sweet treats are available. 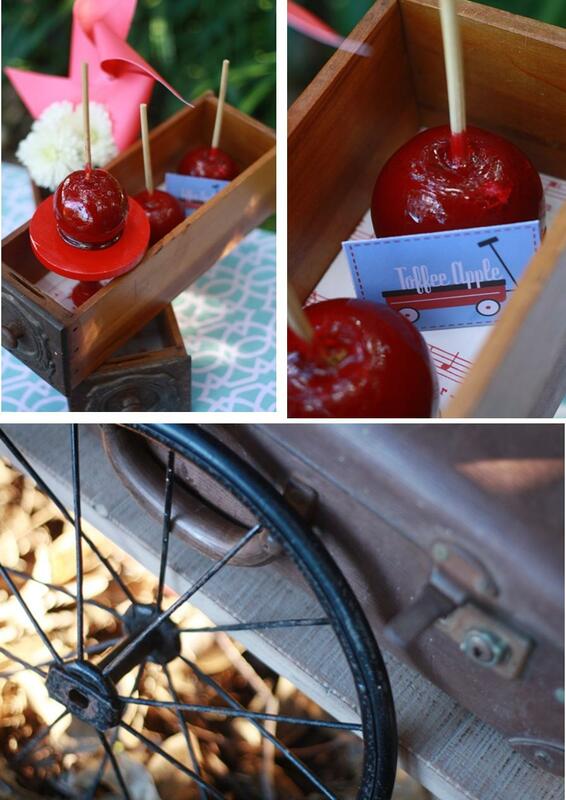 Mon Tresor square scallop boxes were embellished with the Tomkat party circle along with a small wood peg, ready for the children to fill with the candy. 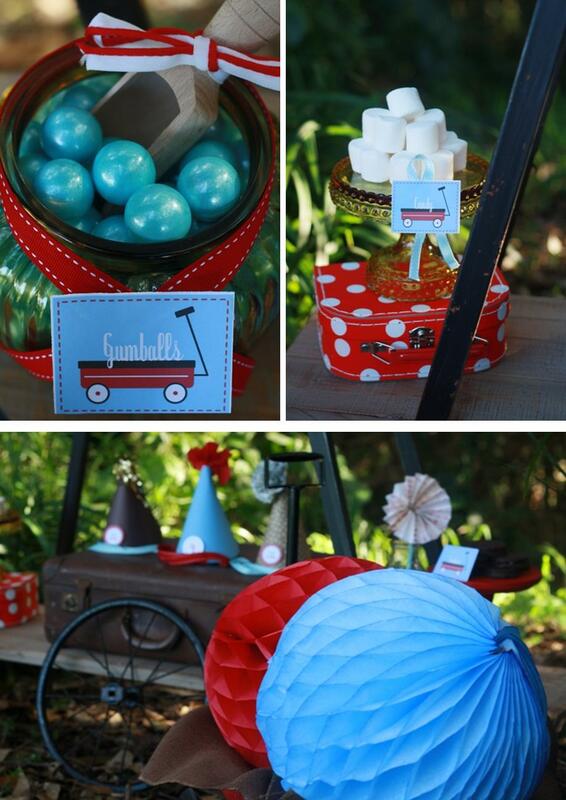 Other props that I included on the trestle shelf were; homemade party hats, a vintage suitcase, homemade pinwheels & mini suitcases & milk glass stands, red ceramic mini bottles to fill with drinks, a vintage whee and of course a red wagon that was filled with chocolate coloured burlap and tissue honeycomb balls. I adore the Little Red Wagon theme printables by the Tomkat Studio because it is a party that beautifully highlights the colours red, blue and chocolate and allows for touches of vintage, industrial and rustic charm to shine through.